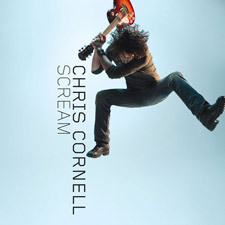 Chris Cornell came roaring out of the Seattle grunge scene as the frontman for Soundgarden, a band with a legacy which extends far beyond “Black Hole Sun,” but after five albums, the group came to a conclusion, and Cornell began his career as a solo artist. Soon, however, he found himself fronting another band: Audioslave, where he worked with Tom Morello, Tim Commerford and Brad Wilk, late of Rage Against the Machine. Fast-forward a couple more years, and Cornell was on his own again, but now he’s completely blowing people’s minds by having teamed up with Timbaland. Bullz-Eye spoke with Cornell about his experiences in recording his new album, Scream, what kind of commercial expectations he has for such a unique collaboration, and whether or not the long-rumored Soundgarden box set will ever come to pass. Bullz-Eye: Hey, Chris, how are you doing? BE: Well, I’ve been a fan of Soundgarden ever since I heard you guys cover Spinal Tap’s “Big Bottom,” so I’ve been one for awhile. CC: Oh, yeah? I did an interview at a recording studio today, and they had the names of the members of Spinal Tap spray-painted on the parking spaces. BE: Nice. Which spot did you take? On the collaborative process:"You have to be on point. You’re showing up to write and record your album more or less simultaneously, so you have to be committed to the fact that, when you sit down that day, you’re going to write a song and record it. You might not want to put it on your album tomorrow, but that’s still what you’re doing to do today." CC: Well, I didn’t take any of them, because I didn’t get much sleep last night, so I just saw the names, thought they looked vaguely familiar, and thought, ‘Oh, wow, those dudes must record here.’ And then as I was parking, I thought, ‘Now, wait a minute, something’s wrong with that…’ And then I realized after I woke up a little bit. (Laughs) I think it was seeing Nigel Tufnel’s spot that finally got me. BE: …but here’s my question: why did you decide to make it? Because it’s jaw-droppingly different from anything you’ve done before. CC: Really, for fun. I mean, I had been kind of thinking of doing different collaborations, even like in the electronic and hip-hop world, and I was coincidentally looking for re-mixers at a time when Timbaland’s name came up as someone who was interested in working with somebody from the world of rock, kind of. And I didn’t really know what that meant, but without actually speaking to him, I heard back that he wasn’t really interested in doing remixes, but he was a fan, and he was interested in maybe doing some original songs. So that got me kind of wanting to talk to him about it, at least, and see where he was at. And right away, he recited a line from “Disappearing One,” from Euphoria Morning, which I was kind of shocked by. I mean, it took me a second to realize what song he was reciting lyrics from! I just sort of expected something like, “Yeah, I’ve heard of you, I remember you from ‘Black Hole Sun,’” that kind of thing. Or maybe he’d be familiar with Audioslave. But that kind of sparked my interest, so we were talking about doing original material, and he mentioned doing two or three songs. I’d heard that he does albums really quickly…like, in two or three weeks, like the Justin Timberlake record. Suddenly this light bulb went off, and I thought, “Wouldn’t it be an interesting experiment to just go in and make an album, the whole thing, with him?” Because I wouldn’t really know what to do with, like, three songs. There’s that new pop method where you record with three or four different producers and put it out on one album, but that just feels like throwing darts to me, like someone’s just trying a bunch of different producers to see if one of them strikes gold and have a hit song. You know what I mean? On meeting with Timbaland: "He recited a line from ‘Disappearing One,’ from Euphoria Morning, which I was kind of shocked by. I mean, it took me a second to realize what song he was reciting lyrics from! I just sort of expected something like, ‘Yeah, I’ve heard of you, I remember you from “Black Hole Sun." CC: But the concept of a whole album to me…I could already tell that this would be completely different from anything I’d ever done if I’d just let him be him and I could be me. It’d be an exciting thing and a challenging thing. And I’d been doing a lot of stuff that’d been unusual. I’d written a song with Brian House. I was going to be doing a “Storytellers”-like kind of thing, and I’d wanted a new song, so I worked with him just based on somebody saying that he’d wanted to write a song or two with me. And it turned out really great. I didn’t do the “Storytellers” thing, because I ended up doing this Timbaland project, and that didn’t really fit – I’ll do that some other day – but I wrote the song with him, and it was the first time I’d ever really sat down with someone I’d never met before to write a song. Well, except for the members of Audioslave… (Laughs) …who I’d met, but, y’know, I didn’t really know them. And then I did “You Know My Name” for “Casino Royale” with David Arnold, who became a really good friend of mine, and I had a really great experience with him. And I just thought that, rather than use a producer in the normal producer capacity, like I did with Carry On with Steve Lillywrite, this would be different. This would be kind of like a collaborator, and in a musical world that would be completely different. And I was kind of interested in that, especially with the writing and recording process being pretty much…I mean, you have to be on point. You’re showing up to write and record your album more or less simultaneously, so you have to be committed to the fact that, when you sit down that day, you’re going to write a song and record it. You might not want to put it on your album tomorrow, but that’s still what you’re doing to do today. And there’s something about that that I really like. But it’s a little bit terrifying. You have to believe in yourself and the person you’re working with enough to make that commitment, and there isn’t’ really any second guessing happening while you’re doing it. And that’s something that, frankly, is one of the reasons why I like not being in a band. I loved being in a band when I was in a band at the different times that I was, but one of things that any member of any band will tell you is that there’s the pausing to get a committee to vote on something, pausing to get someone else’s reaction, pausing to try and read someone else’s reaction, even if you don’t believe what they’re saying. This is sort of the opposite. There’s no concern about reaction, and, really, there’s not even a real concern about the outcome as much as there is the process. You make the decision later as to what it means and if you like it or not. But making a commitment to completely work with someone you don’t know, even if maybe you’re working in a way that’s unusual, all of that really appealed to me. BE: So did either of you come in with sketches of songs, or did you literally build it from the ground up? CC: No, I actually had planned on a week or two weeks of just kind of sitting around and coming up with ideas of my own – riffs or parts or lyrical ideas, that kind of thing – but about a week before we started, I just abandoned that idea, because I already wasn’t having as much fun as I wanted to have. I was trying to be prepared for something that was unpredictable, and it just seemed so stupid all of a sudden. So when we went in, neither of us brought anything in…and I sat there for two days waiting for Timbaland to bring in the first beat idea. We had a conversation on Day 1 about where to go, and how we should proceed, and we just both decided that the best thing to do was that he’d do what he normally does, and then I’d do what I normally do over it. Keep it simple. (Laughs) And with that, we didn’t really discuss any musical direction, any genre direction, or have any concern about genre, period. The only discussions we ever had about the directions of songs were the ones you’d normally have with any producer in any situation, which is, y’know, “This song seems to do the same job as that song, in terms of its overall feel,” and that kind of thing. Otherwise, we really just wrote and recorded. BE: So what are your commercial expectations for the album? Because people who listen to dance music…and this is certainly easy to dance to…are generally pretty accepting of anyone who tries something different, but at the same time, I’d have to guess that there are Audioslave and Soundgarden fans who are weeping even as we have this conversation. CC: Well, the thing is, there isn’t anything to gauge it by, so I don’t really have any expectations. It’s not really like anything else. Even the collaboration as a whole isn’t like anything else. This isn’t like other hard rock bands having cameos from hip-hop guys or hip-hop guys co-writing or producing hard rock guys. Generally, what that sounds like and what it looks like on paper is an aggressive drum loop with a lot of fuzzy guitars, and then a guy is sort of screaming vocals over it, and then there’s a 16-bar breakdown with a rap in it. None of my record is like that. Not to mention the fact that it then became this one hour of continuous music… (Laughs) …which happened after the songs were written. And the influences seemed to come from a lot of different places. So I can’t really compare it to anything, nor can anyone else, as far as holding it up to someone else’s album and their commercial performance. So with that, I really don’t have any specific expectations. I don’t know what it will do. I think it’s very similar to any album that anybody releases, in that if it strikes a chord, people will buy it. And how and when that happens is always kind of unpredictable. BE: The album actually ends with “Two Drink Minimum,” which is a bluesy rock number that’s unlike anything else before it. Should that be taken as a hope that the next album will not necessarily follow the same mold, that you’re just trying something different? CC: It should be taken that all hope should be dashed that I will repeat the same sound of this album. BE: I know we’re on a schedule here, so I’ve got some random questions about various moments from your career. First off, did you breathe a sigh of relief when Matt Cameron permanently replaced you as Soundgarden’s drummer? CC: Well, the first guy that replaced me was Scott Sundquist. That was about a year before Matt, and in that year, I definitely was replaced, y’know? It was clear that, when Scott wasn’t going to be in the band anymore, we were going to get another drummer. So, yeah, I was definitely having a much better time, and the live shows immediately took a turn. That’s when we really started getting a bigger audience, because Seattle, at the time, had these really stringent liquor laws and minor musicians laws, and you couldn’t do all-ages shows where alcohol was served in any way. You couldn’t do all-ages shows, period, because of insurance issues. So, basically, we were doing bar gigs or illegal shows, and it was really hard to get an audience to form that would follow you in that scene, anyway. So once we became a four-piece, we already had a bit of a following, but that was when we really started to play in front of real numbers in our own town, because the show took a turn and became something else completely. And I was never very good at singing or drumming when I was doing both at the same time. It was hard. BE: Did you just take on drumming duties by default? CC: Actually, I started as a drummer, so I sort of took on singing duties by default! (Laughs) I had sung backgrounds and some lead vocals from behind the drums in different bands that I’d been in, and I’d gotten great responses for the songs I would sing. I really started pursuing the possibility of being a lead singer based on the fact that I was working a full-time restaurant job and then playing gigs at night, hauling drums around. One day, it just dawned on me that, “Hey, I could be in a band and be the singer, and it would be a lot easier!” I literally started imagining myself with my own SM57 in a little case, taking it out of my glove box, instead of unloading a trunk full of hardware from my four-door ’69 Toyota Corona. (Laughs) I really enjoyed playing drums, and the original Soundgarden songs…the ones that we refer to as The First Fifteen, ‘cause they were the first songs that we wrote…a lot of those songs were kind of based on jams surrounding these drum beats and jungle rhythms that I would come up with. And I really enjoyed that. When it came time to sort of become a four-piece band versus a three-piece, I was open to being replaced as the singer equally to being replaced as the drummer, as long as it was somebody who was great. And there just wasn’t anybody. It turned out to be six years later when all of a sudden all of these great singers started emerging from bands from different areas in the Northwest; at that time, though, there was just nobody we could find. We kind of knew everybody in the scene, and nobody could sing…well, y’know, better than me, at least. (Laughs) So it was kind of by default. And a pretty short period of time after we started, I grew a lot as a singer, too, just from on-the-job training and a lot of rehearsals, experimenting with my voice. A lot of the experimentation came from being a fan of post-punk indie music, where everybody that was a singer in that world was expressive. It was a cool time. BE: What’s the oldest song in your sets nowadays? CC: Probably something from 1989 or 1990. I do things from Louder Than Love, and…the songs that I do, I don’t really remember exactly when I wrote them, so it could’ve been ’89 or it could’ve been ’90. But that’s about as far back as it goes. BE: How was Steve Lillywhite to work with as a producer? Because I always think of him as the master of ‘80s bombast, but how was he with a current sound? On Soundgarden: "When I was a kid, I discovered bands that had been broken up but that I’d been turned on to by my older brothers. 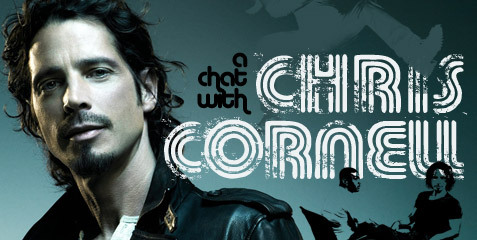 I think it’s important that a (Soundgarden) box set come out, and that a B-sides album comes out, and that we have an active website, where people can be active fans of the band." CC: Well, with me, there was no bombast. (Laughs) As a person, he was this guy who…well, you look at just the scope of his career and how many records the guy has sold with his name on them, but he had no personal assistants, and he didn’t have a Blackberry blowing up all the time. He just drove himself to the studio in a little Mini that he rented, and he had a little backpack, and he was just super down to earth and really easy-going. BE: How did Jason Falkner come to play on Euphoria Morning? CC: To be honest, I don’t remember who recommended him, but I’m pretty sure that he was friends with Alain Johannes. I’m not sure if it came from him first or who brought up the idea, but he was somebody to use. BE: I’m sure you’ve been asked about the possibility of a Soundgarden reunion a thousand times, but I’m just as curious if there’s been any forward movement with the possible Soundgarden box set – including B-sides and rarities – that Kim (Thayil) has brought up in interviews. CC: Well, no, but we’ve met a few times recently to talk about that kind of stuff, and we all seem to be motivated enough to at least in a room and talk about it more than we have been in a long time. And I think it’s one of those things where it’s probably kind of overdue. I think that we made a huge contribution to our generation of rock music, and when it comes to the business representatives of Soundgarden, I think they kind of let Soundgarden down as far as keeping our legacy out there and active. We need to kind of go back in, I think, and get some things going to, y’know, get stuff out there to our fans…and to new fans, because new fans are being made. Like, when I was a kid, I discovered bands that had been broken up but that I’d been turned on to by my older brothers. I think it’s important that a box set come out, and that a B-sides album comes out, and that we have an active website, where people can be active fans of the band, and merchandising and things like that. I think we were an important band. 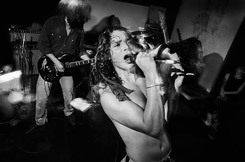 BE: And I know I’m up against the wall with my time, but I promised one of my best friends…the first one who introduced me to Soundgarden, actually…that I’d ask this: what would it take for you to sing “Beyond the Wheel” at her 40th birthday party, preferably shirtless? CC: A hundred million dollars. BE: Is that with or without a shirt? BE: Okay, I’ll quote her the figure. BE: Well, it’s been good talking with you, and good luck with Scream. CC: Thank you, I appreciate it. Take care.